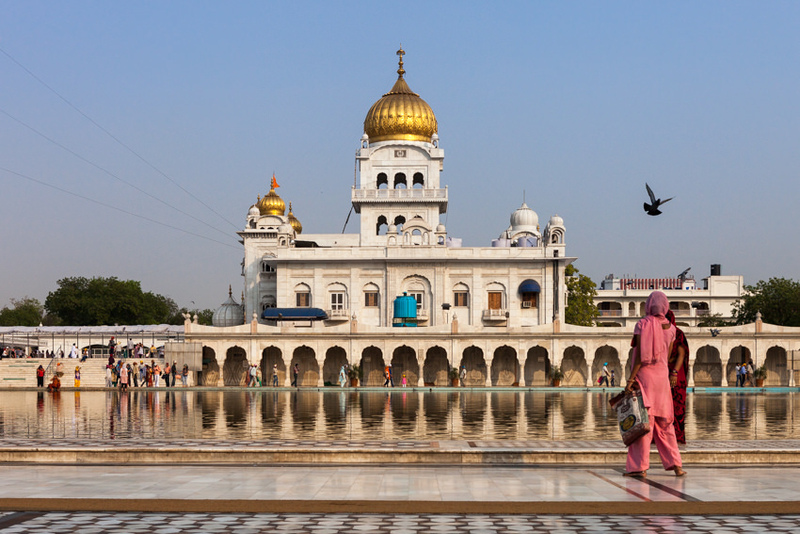 Bangla-Sahib-Gurudwara is situated in Connaught place in Delhi and it is a scared place of worship for people who follow Sikhism. It has rich values of Sikh tradition of brotherhood, spirituality and better future to all living beings. 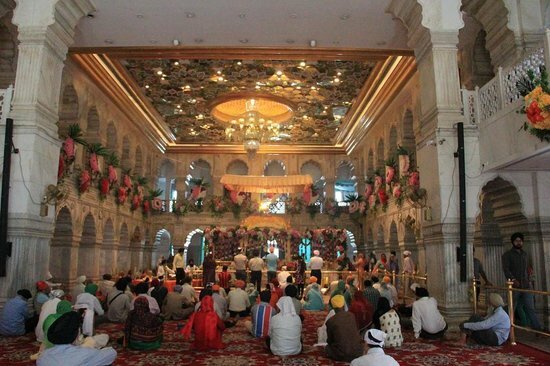 People from different religion, caste creed visit the gurudwara every day to take the blessings of the guru Har Kishan, the 8th Sikh Guru and of the holy water called as Sarovar which is inside Gurudwara. The beauty of Gurudwara is the magnificent work of sikh architecture. One should go and see the beauty and feel the power of Guru in Gurudwara. It is adorned by imposing golden dome and a flag pole. The flooring is done with marble which leads to prayer hall. Some other architectural features of Gurudwara include chattris, pavilions with curved tops lining the roof and multi-arched hanging windows (“jharokhas”). The interiors of the Gurudwara are magnificent. As one enters inside the shrine one can see the religious motifs embossed in gold work. The most beautiful is the intricate peacock figurines that are surrounded by vases. 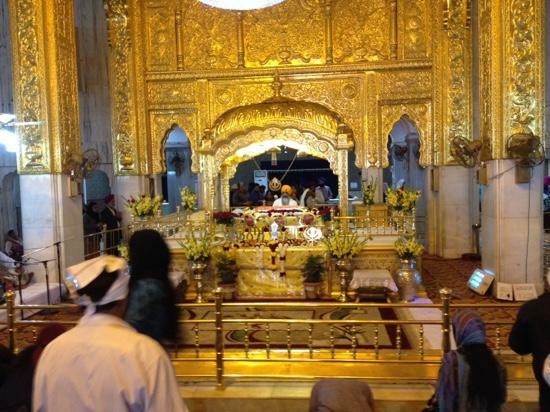 On either side where devotees sit for prayer underneath an immensely intricately sculpted curved gold shrine is placed a copy of Guru Granth Sahib, the Sikh holy scripture. Elderly persons sing melodious sermons referring to God and the Gurus while a priest continuously fans the hallowed text. There is an art gallery in the basement of Gurudwara which is worth watching. They showcase the paintings and historical events with relation to Sikh history. The gallery is called named after the Sikh general Sardar Bhagel Singh. Originally this bungalow belonged to Raja Jai Singh of Amber. He was a ruler in 17th century. The bungalow was known as Jaisinghpura palace. Aurangzeb, the Mughal emperor summoned Guru Har Kishan to Delhi to show his miracles in Mughal court. Following the invitation Guru Har Kishan stayed in Raja Jai singh bungalow. During this time a severe epidemic of cholera and smallpox broke in Delhi. Guru Har Kishan helped the poor and the down trodden who were suffering from the epidemic. Guru served the holy water which had a miracle effect in healing the epidemic. The two epidemics were on high at that point of time. It was not late when Guru Har Kishan himself contracted these two fatal diseases on to him. He expired in the year 1664. Even now the sarovar is considered as sacred and thousands of tourists and people who visit Gurudwara take holy water along with them. It is believed that the holy water has the healing power for many diseases. Bangla sahib gurudwara servers delicious and authenticated lunch to all visitors everyday. In fact, one of the notable and humble customs in all Gurudwar’s is to serve lunch to everyone who comes to Gurudwara. Such a lunch is called as ”Langar” which is served from 9 am onwards. Langar is served free of cost to all visitors irrespective of caste, creed, religion, rich or poor. Langar usually consists of roti, dal (lintel soup) , Kheer and subzi. It is usually prepared by the volunteers who visit the Gurudwara. Anyone can enter the kitchen and prepare langar. The “karha prasad” (a thick pudding cooked from wheat flour, clarified butter and sugar) is very delicious langar. It can be said that a visit to such sacred place and enjoying the music and langar is truly enjoyable. Open 24hours on all days of the week. Both men and women should cover their head before entering the premises. Head scarfs are available outside for free of cost. Everyone should remove their shoes before entering the premises. Should not litter and keep the sanctity of the Gurudwara.